3D optical data storage is the term given to any form of opticaldata storage in which information can be recorded and/or read with three dimensionalresolution (as opposed to the two dimensional resolution afforded, for example, by CD). This innovation has the potential to provide petabyte-level mass storage on DVD-sized disks. Data recording and readback are achieved by focusing lasers within the medium. However, because of the volumetric nature of the data structure, the laser light must travel through other data points before it reaches the point where reading or recording is desired. Therefore, some kind of nonlinearity is required to ensure that these other data points do not interfere with the addressing of the desired point. No commercial product based on 3D optical data storage has yet arrived on the mass market, although several companies are actively developing the technology and claim that it may become available soon. The origins of the field date back to the 1950s, when Yehuda Hirshberg developed the photochromicspiropyrans and suggested their use in data storage. In the 1970s,ValeriBarachevskii demonstrated that this photochromism could be produced by two-photon excitation, and finally at the end of the 1980s Peter T. Rentzepis showed that this could lead to three-dimensional data storage. This proof-of-concept system stimulated a great deal of research and development, and in the following decades many academic and commercial groupshave worked on 3D optical data storage products and technologies. Most of the developed systems are based to some extent on the original ideas of Rentzepis. A wide range of physical phenomena for data reading and recording have been investigated, large numbers of chemical systems for the medium have been developed and evaluated, and extensive work has been carried out in solving the problems associated with the optical systems required for the reading and recording of data. Currently, several groups remain working on solutions with various levels of development and interest in commercialization. Optical storage systems consist of a drive unit and a storage medium in a rotating disk form. In general the disks are pre-formatted using grooves and lands (tracks) to enable the positioning of an optical pick-up and recording head to access the information on the disk. Under the influence of a focused laser beam emanating from the optical head, information is recorded on the media as a change in the material characteristics. The disk media and the pick-up head are rotated and positioned through drive motors controlling the position of the head with respect to data tracks on the disk. 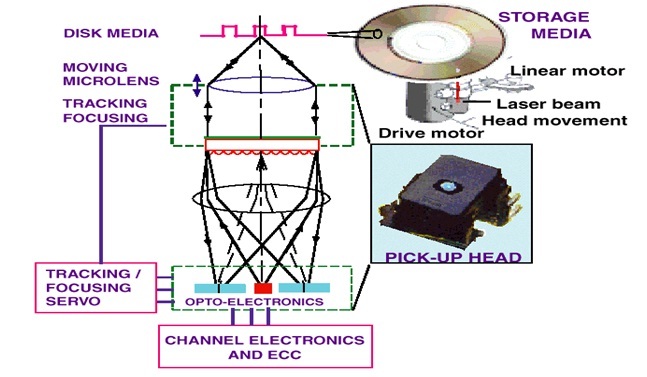 Additional peripheral electronics are used for control and data acquisition and encoding/decoding. 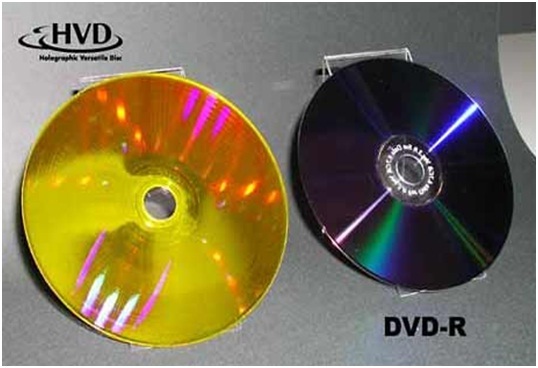 As an example, a prototypical 3D optical data storage system may use a disk that looks much like a transparent DVD. The disc contains many layers of information, each at a different depth in the media and each consisting of a DVD-like spiral track. In order to record information on the disc a laser is brought to a focus at a particular depth in the media that corresponds to a particular information layer. When the laser is turned on it causes a photochemical change in the media. As the disc spins and the read/write head moves along a radius, the layer is written just as a DVD-R is written. The depth of the focus may then be changed and another entirely different layer of information written. The distance between layers may be 5 to 100 micrometers, allowing >100 layers of information to be stored on a single disc. In order to read the data back (in this example), a similar procedure is used except this time instead of causing a photochemical change in the media the laser causes fluorescence. This is achieved e.g. by using a lower laser power or a different laser wavelength. The intensity or wavelength of the fluorescence is different depending on whether the media has been written at that point, and so by measuring the emitted light the data is read. 3D optical data storage is related to (and competes with) holographic data storage. Traditional examples of holographic storage do not address in the third dimension, and are therefore not strictly "3D", but more recently 3D holographic storage has been realized by the use of microholograms. Layer-selection multilayer technology (where a multilayer disc has layers that can be individually activated e.g. electrically) is also closely related. Holographic data storage is a potential replacement technology in the area of high-capacity data storage currently dominated by magnetic and conventional optical data storage. Magnetic and optical data storage devices rely on individual bits being stored as distinct magnetic or optical changes on the surface of the recording medium. Holographic data storage overcomes this limitation by recording information throughout the volume of the medium and is capable of recording multiple images in the same area utilizing light at different angles. Additionally, whereas magnetic and optical data storage records information a bit at a time in a linear fashion, holographic storage is capable of recording and reading millions of bits in parallel, enabling data transfer rates greater than those attained by traditional optical storage. The stored data is read through the reproduction of the same reference beam used to create the hologram. The reference beam’s light is focused on the photosensitive material, illuminating the appropriate interference pattern, the light diffracts on the interference pattern, and projects the pattern onto a detector. The detector is capable of reading the data in parallel, over one million bits at once, resulting in the fast data transfer rate. Files on the holographic drive can be accessed in less than 200 milliseconds.